Isidor Kaufmann, Rabbi with Young Student. Oil on panel. Est. $350/550,000. Sold for: $512,500. Photo: Sotheby's. NEW YORK, NY.- Sothebys annual December auctions of Important Judaica and Israeli & International Art brought a combined total of $7,908,754 today in New York, and many first time buyers participated in both sales, including purchases of some of the major top lots. Collectively, the sales were led by A Magnificent Passover Haggadah by Aaron Wolf Herlingen, which sold for $962,500. The Important Judaica sale totaled $4,056,191, within the pre-sale estimate of $3.9/5.7 million. The sale this afternoon of Israeli & International Art brought a total of $3,852,563, against a pre-sale estimate of $3.5/4.98 million and was highlighted by a group of works by celebrated artist Reuven Rubin. The morning sale of Important Judaica was led by top prices for manuscripts and paintings. The top lot of the auction was The Herlingen Haggadah, a magnificent example of the 18th century revival of Hebrew manuscript illumination that began in Vienna, which brought $962,500, well over the low estimate of $800,000). * Written and illustrated by Aaron Wolf Herlingen in 1730, the manuscript is one of the scribes finest efforts, as evidenced in the superbly written letters of the text and commentaries. In addition, An Extremely Rare and Important Early Mahzor, France, 13th century sold for $218,500, against a low estimate of $180,000. The work contains the liturgy from Yom Kippur, Sukkot and Hanukkah according to the French rite and contains several customs and traditions that are unknown from any other source. The sale also featured the Kagan-Maremba Israel Coins and Medal Collection, which brought $572,500, and was sold on behalf of the Jewish Museum, New York to benefit the Acquisitions Fund. Paintings in this mornings sale featured several important paintings by Isidor Kaufmann. 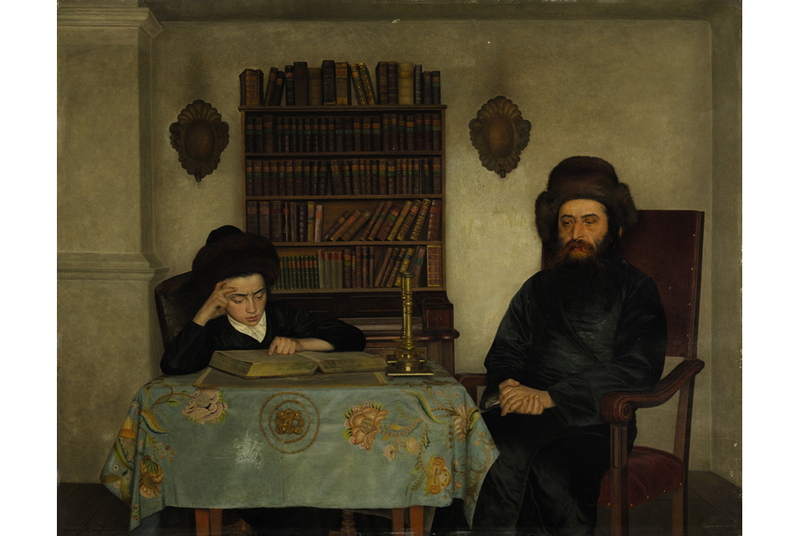 Rabbi with Young Student by Kaufmann brought $512,500 (est. $350/550,000) and was originally in the celebrated collection of Oscar and Regina Gruss, as was The Kabbalist, which sold to a European private collector for $218,500. Other highlights included Isidor Kaufmanns Portrait of a Rabbi which sold for $74,500, well over its high estimate of $50,000. The afternoon sale of Israeli & International Art was led by Reuven Rubins Jerusalem Seen from Mt. Scopus from circa 1927, which brought $542,500 (est. $300/500,000). One of the most important views of Jerusalem to appear at auction, the canvas was included with four other views of the city from various periods in the important 1998 exhibition of the artists works at the Rubin Museum in Tel Aviv. Rubins 1920 rare and important Self Portrait, having been held in the same private collection since the early 1920s, sold for $434,500, well over its high estimate of $300,000. An additional work by the artist, Musical Interlude: Homage to Casals, brought $158,500, over its high estimate of $150,000. Works by Contemporary artists in the afternoon sale also fared well, including Yaacov Agams The Covenant / The Twelve Tribes that sold for $242,500). This monumental work was commissioned by Edward and Rosalie Ginsberg of Cleveland, Ohio, who were long-time friends with the artist after meeting in Israel. In addition, Agams Orchestration on White from 1975-76 soared above its high estimate of $90,000 to eventually bring $230,500. Other highlights from the sale include Yohanan Simons At the Kibbutz which brought $128, 500 (est. $60/80,000), as well as Woman in an Armchair by George Kars that sold for $68,500 against an estimate of $20/30,000.